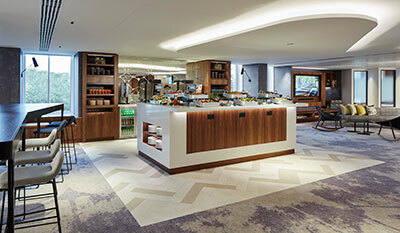 C&IT's Venue of the Week is London Heathrow Marriott, which recently unveiled a multi-million pound refurbishment to its conference facilities. As the A4 Bath Road runs adjacent to Heathrow it becomes a ‘high street’ for big hotel brands. Virtually all of them have a presence there, and for good reason – being a stone’s throw from Britain’s busiest international hub means guaranteed income, whether that’s an overnight stay for leisure travellers, a business stopover or a short room booking for airline staff. For the same reason, these properties are a magnet for meetings and conferences. But despite healthy competition, they tend not to be the most exciting hotels. Functional, rather than design-led. A means to an end. So, as C&I Traveller approached the London Heathrow Marriott, pondering how more planes could ever safely pass through the local airspace were a third runway ever built, that’s what it had in mind. It was a pleasant surprise. 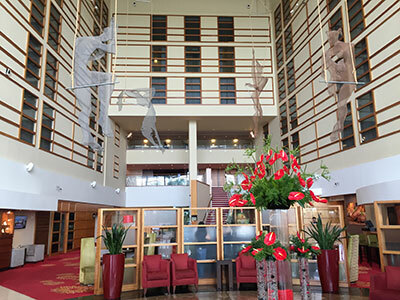 The entrance leads straight into a huge, airy, light-filled atrium with suspended trapezes adorned with sculptures – certainly not your typical airport hotel welcome. A four-month refurb of the property began at the start of the year and finished in May, the main beneficiary being a completely redesigned suite of meetings and event spaces. Even at the top of the property Premier League, conference facilities are rarely more than functional, but Marriott has put a great deal of thought (and money) into its new offering. 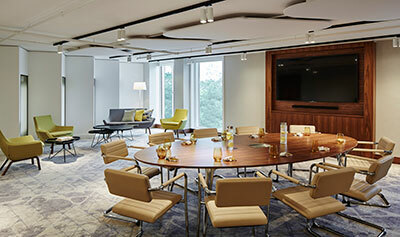 Some 1,800 square metres of aviation-themed, beautifully designed space across 16 rooms provides a huge variety of options for planners, including six new meeting rooms with natural daylight. The latest tech is installed throughout, with creativity and flexibility to the fore: rooms have write-on walls, Barco Clickshare technology and Bluetooth Sound Bars. There is also 872sqm of breakout space with satellite bars and modern, quirky furniture and artwork. 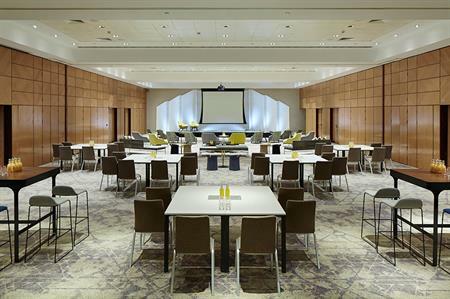 The largest space – the Lindbergh Suite – can host up to 480 delegates for a seated conference. Elsewhere, the hotel has nearly 400 soundproof bedrooms, an indoor pool and leisure club, two bars, a Starbucks and two restaurants: Allie’s American Grille for hungry carnivores and Tuscany Ristorante, which serves delicious Italian cuisine and offers a live show kitchen. In the most mundane of settings, the Marriott stands out from its neighbours and, in particular, should be seriously considered by planners seeking somewhere modern for a conference or event right next to the airport.